Funds are allocated annually towards an award to one Regular Force and one Reserve Force Sergeant, each of whom demonstrates outstanding leadership that has a positive effect on The Royal Regiment of Canadian Artillery. The award was approved in its current form at The RCA Senate meeting of 22 February 13. The trophy is an 18 Pounder Gun with Limber handcrafted by Lieutenant-Colonel David Ely and donated by his son, Mr. John Ely. The names of the recipients are inscribed on the wooden mount and each is given a lasting token in recognition of their leadership abilities. Open to all substantive Sergeants of The Royal Regiment of Canadian Artillery, as well as all Sergeants of other trades/branches serving within units of The Royal Regiment during the assessment period. The Award is for the individual, whose performance has demonstrated over the period of the assessment year, outstanding leadership, emphasizing the example set, the gaining of the respect of his or her subordinates, peers and superiors, and the positive effect on The Royal Regiment of Canadian Artillery. Factors that should be considered in the selection include competence, confidence, courage, fitness, integrity, military achievement, self-improvement, education advancement, and loyal and dedicated service to The Royal Regiment. The assessment period will be from 1 April to 31 March annually. Within units of The Royal Regiment, nominations may be made by any individual and forwarded through the unit chain of command. Within other sections/units, submission may be made through the senior Gunners in the region/area. Nominations for the Award shall be made using the form at Appendix 1. The submission shall be accompanied by a separate Word document with a narrative composed for readers who are unfamiliar with the member. The narrative must concentrate on highlighting the accomplishments of exceptional leadership and conspicuous merit displayed by the Sergeant. The narrative shall be a maximum of one page with a font of Times New Roman, 11 point. The use of acronyms and obscure terminology should be avoided. At a minimum, submissions must be signed by a MWO and Major, but ideally by a CWO and LCol (RSM and CO). All submissions are to be forwarded directly to the Regimental Headquarters Sergeant Major (RHQ SM) at Regimental Headquarters, RCA (RHQ RCA) no later than 26 May. The RHQ SM will forward all submissions electronically, less personal and unit identifying information, to the RSM RCA who will conduct the selection procedure with unit RSMs to recommend a primary and secondary winner for both the Regular and Reserve Force. These recommendations will then be submitted to the Regimental Colonel for staffing to the Colonel Commandant and the Senior Serving Gunner, who, in collaboration with the RSM RCA, shall approve the award recipients. The recipients of the Award will be announced on 4 December of each year. The presentations will occur at a later date by the Colonel Commandant and RSM RCA or appropriate senior RCA leadership. 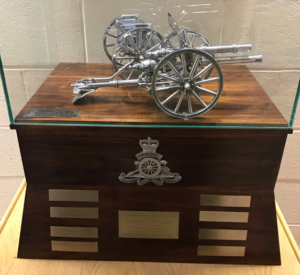 The trophy, inscribed with the recipient’s name, is kept on display in at the entrance to The Royal Regiment of Canadian Artillery School.